Oasis Cafe is Salt Lake City's "happy place" for dining. I'm not quite sure how this happened, but over the span of many years and thousands of dining articles, I somehow never got around to writing a review of Oasis Cafe. Maybe the venerable spot on 500 East just got lost among the glitz and glamour of newer, shinier establishments. And that's a shame, because the aptly named Oasis Cafe really is an urban escape for anyone looking for good food, service to match and a peaceful, comforting ambiance. Oasis Cafe has been a centerpiece of the downtown (or adjacent to downtown) Salt Lake City dining scene for nearly 21 years, since it was opened by Steve Paul and Jackie Pratt in July of 1995. In January 2002, current owners Joel and Jill LaSalle took over stewardship of the cafe and Golden Braid Books, saving them from being turned into an office building. Along with the LaSalles, longtime employees like general manager Will Keesen, executive chef and operations manager Jared Young and chef Efren Benitez keep Oasis Cafe customers happily attended to and well-fed. Drop in to the Oasis Cafe for lunch—even on a Monday or Tuesday—and chances are that most tables will be filled. I can't think of another restaurant in town that caters to such a loyal crowd of repeat customers. Some are gathered for tea and a salad or sandwich with friends or colleagues; others are hunkered down solo making use of the free Wi-Fi or paging through a book just purchased at Golden Braid. No one seems unhappy or hurried. In that regard, Oasis feels as much like a sanctuary as a place to eat. But, eat you must. Because the food at Oasis Cafe is excellent under the current kitchen regime, and the prices almost seem like those of yesteryear: The food and drink here is one of the better bang-for-your-bucks in the city. Take the lunch menu, for example. A grilled-cheese sandwich and soup will set you back $9, but the item's a bit of a misnomer—what you really get is two sandwiches: four crustless (unless you ask to leave the crusts on) half-sandwiches made with white bread, cross-hatched with grill marks and filled with gooey white Vermont and orange cheddar cheeses. Alongside is a heavenly, fresh-tasting roasted tomato and fennel soup—the fennel giving the soup both fragrance and a most subtle anise flavor. It's a terrific, wholesome, housemade lunch for about what you'd expect to pay for a fast-food Subway sandwich, chips and a soda. Another excellent option—either for lunch or dinner—is the tender, flaky grilled salmon filet ($13 for lunch, $20 for dinner), which comes with a luscious honey-lavender polenta cake, fresh arugula and grilled tomato, drizzled with saba, extra virgin olive oil and merlot vinegar. 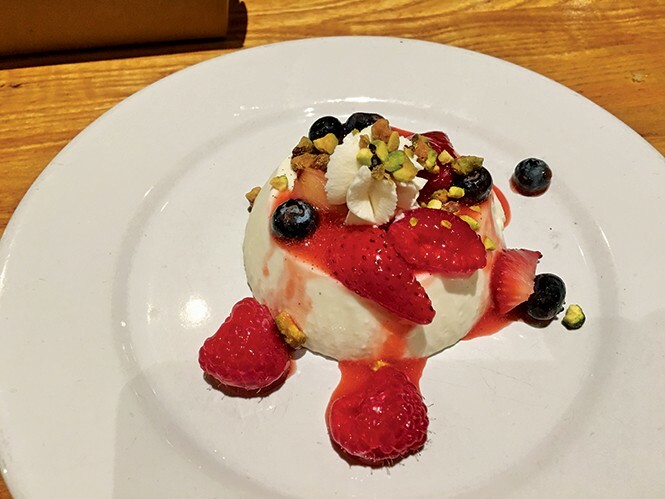 The kitchen's restrained use of lavender in the polenta makes it a gorgeous accompaniment, and that same lavender infusing the Oasis' panna cotta dessert ($7)—with fresh seasonal berries, honey-ricotta cheese and a pistachio crumble—makes it one of my favorite desserts. It's light and lovely, but packs a flavor punch. Having recently spent a couple of weeks in France, dining at times in Michelin 2- and 3-star restaurants, I've found myself craving simpler, less convoluted cuisine. And that's what, in my opinion, Oasis Cafe excels at. There might not be the wow factor of a restaurant like Alain Ducasse, but the flavors of Oasis dishes are pure and honest. Sometimes, less is more. Take for instance the paprika-crusted chicken ($18). I'd take this dish over many of the ones I ate in France. It's so simple I found myself wondering, "Why didn't I think of this?" Two large boneless chicken breasts were pounded thin and then coated with paprika and seared, the result being similar to Louisiana-style "blackened" chicken, but with better, subtler flavor and balance. Along with the generous portion of chicken—half of which I took home as leftovers—was delicious risotto with sweet corn and avocado salad. I can't recall a more satisfying meal in the past few months than this one, particularly when accompanied by a wine such as Norton Torrontes ($35/bottle) from Oasis Cafe's well-conceived wine list. An array of local beers, liquor and cocktails are available as well. Unlike at many other restaurants, vegans and vegetarians are well-tended to here, where those culinary choices "aren't an afterthought or an obligation," according to chef Young, and where each dish is truly inspired and full of flavor. That's certainly true of dishes like wild mushroom strozzapreti ($16), udon peanut stir-fry ($15) or eggplant Parmesan risotto with roasted vegetable pomodoro ($15)—all of which hold as much appeal to a carnivore like me as they do to a vegetarian. Mostly organic and locally sourced foods are used in the kitchen, and that naturalism also dictates décor choices, with motifs of birds and ferns and the use of all-natural materials (often recycled ones) throughout the restaurant and into the beautiful, flower-laden, courtyard patio in warmer weather. The beams high overhead in the restaurant, for example, came from the old Great Salt Lake Railroad tressle, and the walls are made from Rastra—a recycled polystyrene. Keep in mind also that Oasis Cafe serves breakfast/brunch until 2:30 p.m. So, if you've a craving for the bodacious breakfast burrito ($10), a German buttermilk pancake ($9), or an "Oasis Scramble" ($9) and such for lunch, that's a doable option. As someone who dines out for a living, I'm thrilled to have rediscovered Oasis Cafe, and to have been reminded what a special gem it is in our city. Owner Joel LaSalle sums it up best when he says: "Our goal is to help people every day to have a little bit better life and simply be happier." Done and done.